* Visits to the bottling plant can be arranged on days when not in operation. Today more than ever before, the search for the Purist Spring Mineral Water has become an endless crusade. Holkrans has not only recognized the expectations of the consumer, but has solely focused on developing the Purist Spring Mineral Water. 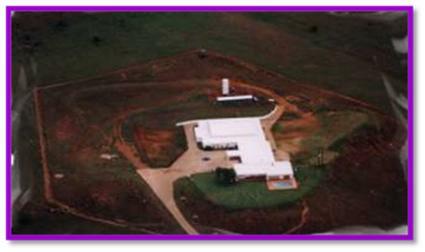 The potential of the Holkrans mineral spring was realized in 1997, by Louis van Vuuren, founder member of the South African Bottled Water Association, but to ensure that this was the purist spring water given to us by Mother Nature it was decided to call on the expertise of the South African Bureau of Standards to Test, Verify and Confirm that this spring mineral water conform to the international standards. The purist spring water is derived from recharging the Sandstone/dolerite aquifer on the plateau above the point where the spring emanates. The chemical analysis that was done by Dr Brendenkamp (PH D MSc) shows no contamination and the risk of pollution of the source is minuet due the inaccessibility of the high laying catchment area that is fully enclosed to ensure no animals or humans enter. 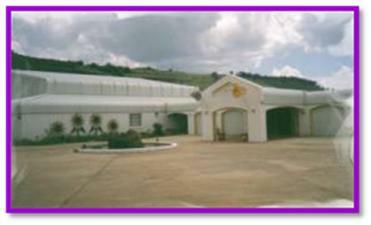 Once the South African Bureau of Standards gave the go ahead to produce mineral water and approved the building plans, the erection of the plant started in March 1997. 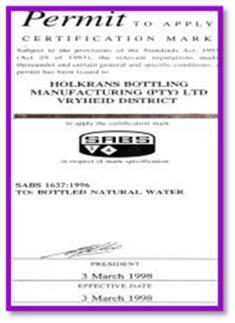 This was duly completed in October 1997, and in March 1998 they issued the necessary certifications to produce the Holkrans spring mineral water under license of the South African Bureau of Standards. To conform to BEE, Holkrans is currently assisted by Mr. B Gallaway in reaching an amicable agreement with Mr. M Shabanu.